WW1 recruiting advertisement from the Grantham Journal, September 19th, 1914. Frank Allcorn, c.1930, in a photograph of the ex-servicemen's club skittles team, outside the club hut on Albert Street (now the Bottesford Scouts Hut). 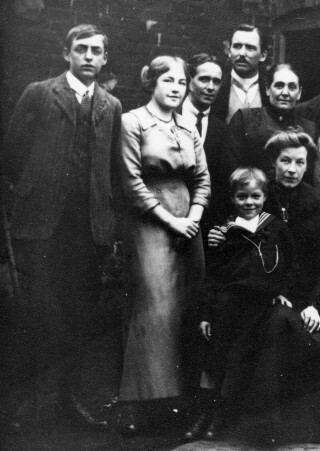 Elsie Hallam, the future Mrs Allcorn, c.1920, from a photograph of Mrs Frances Hallam and her extended family. Frank Allcorn is remembered on the Methodist Roll of Honour in Bottesford. He was also registered as one of the Absentee Voters, and his address was Wyggeston Terrace, in 1918/19. William Allcorn was born in 1855 at Pembury, Kent. When he was 15, he worked as a carter’s boy in Frant, East Sussex. His wife, Elizabeth, was also born in 1855, at Frant, East Sussex. By the time of the 1881 census, William was a railway signalman working at Bottesford, and they lived in a cottage below the approach bridge on the Elton/Nottingham Road. Their first son, Arthur William, was born in Bottesford in 1880. William was still a railway signalman in 1891, and the family were living at the ‘New Railway Halt’, on Nottingham Road. This address refers to what was more generally known as Bottesford South Station. In fact, it may well have been the same house that they had occupied back in 1881. 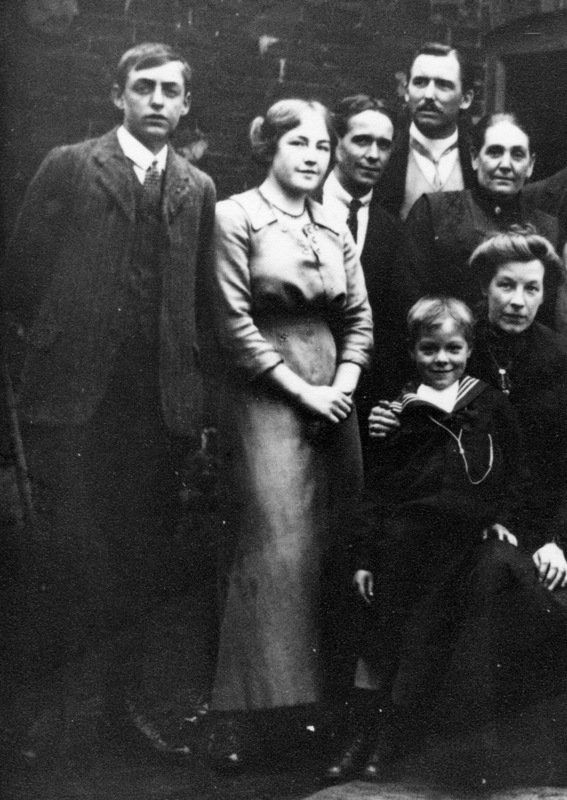 The family now consisted of William and Elizabeth, together with Arthur (b.1880), George (b.1882), Florence (b.1884), Beatrice (b.1886) and Percy Leonard (b.1888). All the children except for Percy were at school. In 1901, William and Elizabeth still lived at what were now referred to as the New Station Cottages, probably still in the same house as in 1891 and 1881. William continued to work as a railway signalman. 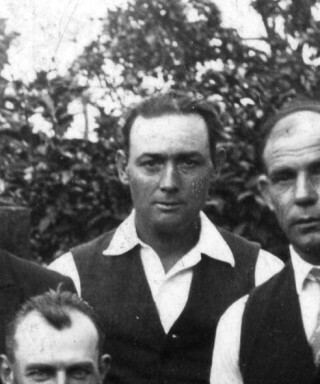 They had three more children – Frederick (b.1892), Francis (b.1894) and Frank, all at school. Frank Allcorn, the youngest of the family, was born on the 15th January, 1896, in Bottesford. In 1911, he was living with his parents, still at the Railway Cottages, and was working as a farm labourer. The Grantham Journal of the 18th September, 1915, reported that on the preceding Tuesday, the 14th September, three Bottesford recruits, Frank Allcorn, William Slater and Herbert Jallands, made their way to Melton Mowbray to be accepted into the Leicesters. Frank Allcorn was posted as a Private in the 9th Leicestershire Regiment and his Service Number was 25905. He served with the Leicestershires, and was badly wounded at Ypres on the 17th November, 1917. He was awarded the British War Medal and the Victory Medal. In 1922, Frank Allcorn married Miss Elsie Hallam, daughter of Mr and Mrs G Hallam of Bottesford. The Electoral Roll of Spring, 1922, tells us that Frank and Elizabeth Allcorn had set up home at a house on Orston Lane, Bottesford. However, in the Spring, 1925, Roll, Frank was at an address on Barkestone Lane, but no other family members were registered in this household. The Electoral Roll of 1927 again has Frank Allcorn on his own, but now back on Orston Lane. Then, the 1931 Roll records Frank and Elsie Allcorn together, living on Orston Lane. No.7 Orston Lane was Elsie Hallam’s family home in the 1911 Census, and perhaps it was this same house that had become the abode of Elsie and husband Frank by 1931. Frank Allcorn died on the 3rd January, 1954, aged 58, his death registered at Melton Mowbray. A woman named Elsie Allcorn died in the Grantham area in 1985. Assuming this to be the same Elsie [we need to see the Death Certificate to be certain], she would have been 86 years old, having outlived Frank by some 31 years. Frank Allcorn’s obituary (Grantham Journal on the 8th January, 1954) reported that he had died at the house called “Ladysmith”, Belvoir Road, Bottesford. He was the youngest son of the late Mr and Mrs W. Allcorn of Bottesford. Prior to serving in WW1, he had been a baker with Messrs. Palmer of Grantham, Mr W Germany of Bottesford and Mr Parr of Redmile. He served with the Leicestershire Regiment ,1914-1918, but was badly wounded at Ypres [17th November, 1917]. In 1922, he married Miss Elsie Hallam, daughter of Mr and Mrs G Hallam of Bottesford, was a regular churchgoer and a member of the British Legion. He was an auxiliary postman in Bottesford for 32 years and retired two years ago (1952). Mr H. Brewster (Head Postman), Mr Edwards, Mrs A. Wing and Mrs A. Ward represented the Post Office at his funeral.